"Chandra, please chant with us," said the abbot Serenok, his heavy sleeve swaying as he gestured to her. Chandra and the monastery's fire monks balanced on floes of solid rock in the lava field, miles from the Keral Keep monastery on Regatha. The air cooked and the landscape wavered with heat. A massive volcano loomed in the distance, belching smoke. Chandra wasn't sure if she was supposed to be here. This was the place where she came into her own as a pyromancer, but it also involved chanting exercises. Chandra put her hand behind her head. "I am not a great chanter," she said. "Then this will be the perfect challenge for you," said Serenok, and his slight smile wrinkled the skin around his eyes. As the abbot, the head teacher of Keral Keep, Serenok counseled the acolytes in the ways of fire magic. Like Mother Luti, the matriarch of the monastery, Serenok had pushed Chandra's talents in fire magic, prodding her to go further in her studies and her understanding of herself. "You have talents that remind me of the one who inspired the founding of this Keep," Serenok said. "I'm not her, Serenok," Chandra said. "You can aspire to be," he answered. "One day." He meant Jaya. Jaya Ballard—a famous pyromancer. But to Chandra she was a kind of myth, a presence that hung in the air of the Keep. Jaya's pyromantic sayings were on every monk's lips and carved into the halls, and her pair of heat-shield goggles rested on a pedestal inside the monastery. Some of Jaya's spells had become ritualized exercises that the fire acolytes practiced—like today, here, in the middle of a lava field. Chandra knew that the lessons had been useful. She could have done without the comparisons. "We can all aspire to be more like Jaya," said Serenok to the others. "Let us begin the exercise." He led the chant. The abbot's voice was clear, but his lungs sounded papery and thin. Chandra noticed his age in the effort of his movements—he had to fight the hunch of his back to lift his head and sing. The other pyromancer initiates joined their voices together, and soon the air filled with sound. Teeth-clashing consonants punctuated low, drawn-out vowels. They moved in concert as well, their feet gliding over the surface of the rock floes, their arms flowing like the heat-distorted air. As they danced, tongues of fire rose from the lava, growing into a fiery circle around them. The pyromantic dance was beautiful, and Chandra danced, too. She embraced herself, tipped her head back, and spun, whipping her arms out and spraying fire from her fingertips. As she moved, she looked up to watch the smoke from the lava field rise into the Regathan sky along with the chant of the monks. Chandra wondered if this was how Jaya would have felt. Did she bring this particular chant to Regatha? Mother Luti knew of Planeswalkers, and had told Chandra that Jaya was one. What words from far-off planes would she have sung to summon the fire? Chandra took in a breath and let out a sound that matched how the dance made her feel—a high, warbling song that rose and rose as she spun. "Chandra," said Serenok. "The spell will fail if you don't participate." Chandra stopped and looked around. The other monks had stopped dancing and were looking at her. The chant had subsided, and the circle of fire with it. "I thought I was," said Chandra. Her hair sparked with flames, but she quickly extinguished them with her hand. "You have to learn to channel that passion into the lessons," said Serenok. "Only together will the spell work and generate the strongest fire. You must dedicate yourself to it." "Try harder," said Serenok, his voice ragged. "These are my final days. Show an old monk what he wants to see." Serenok clapped his hands. "Let us start again. Chandra, remember what you've learned. The lessons are not meant to constrain you. They are meant to help you grow." The abbot put his hands out at his sides and tipped his head back. 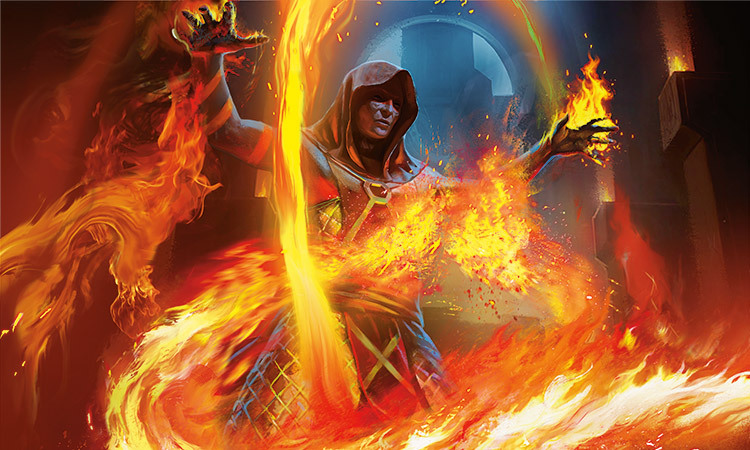 Chandra saw a line of sweat roll down his cheek—was he casting a spell? A cracking, crumbling sound from under the volcanic field. 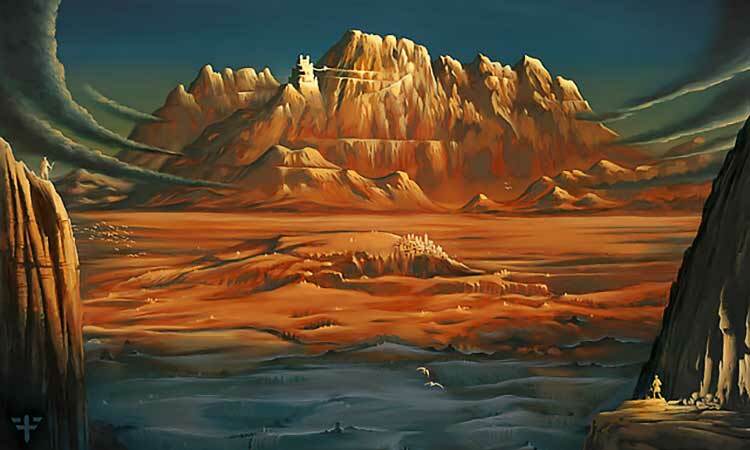 The landscape jolted, and Chandra and the monks stumbled on their slabs of rock. "What is it?" asked one of the acolytes, whipping his head around. "An earthquake?" asked another monk. A mound of molten rock rose from the lava plain, cutting them off from the direction of the monastery. Something alive was rising out of the lava—something alive, and big. "Quickly," said Serenok. "Let us chant again." "Is this the best time to be practicing our singing?" Chandra asked. "Raise the defenses, as I've taught you. Quickly!" Serenok sang out, and the monks joined him, resuming their dance. The ring of fire encircled them again and began to rise. Something gigantic burst forth from the lava bed. A toothy, scaly head ringed with stony tentacles rose high, followed by a long pillar of a neck with crawling spikes along its edges. The thing was the size of a wurm, but was clearly adapted to swimming through volcanic rock. "Hellion!" shouted one of the monks. "Maintain the chant!" shouted Serenok. The hellion roared into the sky, belching fire and sulfurous gas. It rotated its body to regard the monks, its tendrils wavering. Its mouth was big enough to engulf any of them in a single bite, but Chandra thought it looked like it would probably enjoy chewing. The monks chanted and danced, and the wall of fire rose around them, blocking out the hellion. As the flames rose, Chandra looked around to the fire monks and tried to imitate the sound and cadence. Let's go, Nalaar, she thought. This same chant is carved into the walls all over the Keep. You can do this. She looked at Serenok and tried to mimic his movements. She saw the beast's head rear back over the rising wall of flames. Its mouth-tendrils flexed, and it roared. Chandra gave up trying to chant. She turned to face the hellion, and her hair and hands erupted in a blaze. She whipped two missiles of fire at its belly, but its heat-resistant scales were barely singed. The hellion attacked, its head slashing down through the flame wall, aiming directly at an acolyte. The acolyte dodged, leaping onto another floe of rock as the hellion crashed through the one that had supported him. The fire barrier's flames singed the hellion's scales, but again, the meager heat didn't even slow it down. Chandra gritted her teeth and balanced herself on the balls of her feet. As the hellion dipped its head down, she sprung onto its side, grabbed hold of its body spines, and clambered onto its back. The hellion immediately bucked and shrieked, and its tendrils lashed out to try to grab at Chandra. She grabbed two of the tendrils, planted her feet on its ridges, and steadied herself on its back. "I've got him!" Chandra shouted. The hellion swiveled and twisted its body around, and suddenly its back was its front. Now Chandra was dangling from its tendrils, her legs flailing. "Aim for its head!" said an acolyte, conjuring a fire spell. "Don't aim for its head!" yelled Chandra, who was dangling from the beast's head. Chandra held on, swinging. She angled her body to get purchase with her feet and kicked, flinging herself up and over to the top of the hellion's head. The hellion snapped and bucked, but Chandra heated her hands white-hot, and her fingers pierced into its rugged hide. She clamped herself on. Chandra wondered what she had gotten herself into—not an unfamiliar feeling. The monster's tendrils were thicker here at the head, and they flailed at her, some of them striking pieces of armor, but others lashing skin. She grimaced at her white-hot hands, half buried into the monster's armor, and knew she couldn't sustain such heat for long. She needed more heat, more than she could create alone. "I have a bad idea," she shouted to the others. "I changed my mind. When I say so, aim for me!" Chandra timed her move with the next twist of the hellion's body. She released her grip and half-ran, half-slid down its belly, fighting off its lashing tentacles with a sweeping arc of fire. Once she reached its belly, near where it emerged from the lava field, she grabbed on with both hands and turned back to look it in the eye. With a grunt of effort, she punched her white-hot hand into its armor. The hellion lunged its head down at her as a reflex, and Chandra leaped. As its toothy maw came down, Chandra leapt out of the way, and the hellion bit hard into the ridged plates of its own belly. For the moment, its jaws were stuck. Chandra landed on one of the rock floes. She turned to face the monks, beckoning to them. "Now!" she yelled. "Fire! Right at me!" The other monks stood rigid, looking to Serenok. This wasn't any part of their teachings. The abbot looked at Chandra in the eyes for an aching second, deciding. The hellion shrieked and jerked, its teeth stuck in its own rock-hard armor. "Now!" pleaded Chandra. "Do it!" Serenok looked to the acolytes, and nodded. 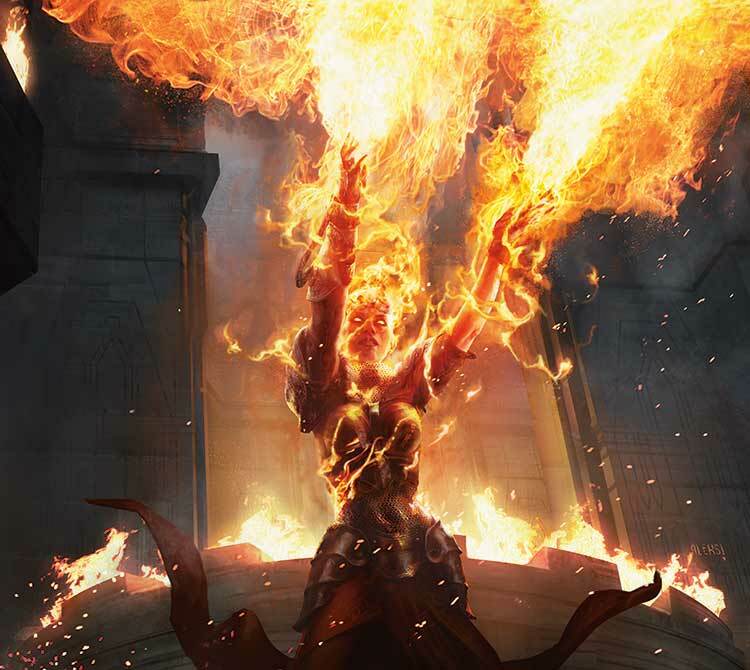 The fire monks shouted, thrust their hands out, and unleashed a dozen separate fire spells at Chandra. Chandra had only a moment as the comets and spheres of flame raced toward her. She timed her move, then twirled around on her feet, guiding the fire spells with her hands as she spun. In one motion, she wove the strands of fire together into a needle-sharp streak of blindingly hot fire. She curved it around her body, feeling its skin-crackling heat as it passed, and guided it right into the hellion's head. The spike of fire pierced into the armored hide of the monster's forehead and drilled deep, hitting tender tissue. With a whip of its body and a shriek, the hellion thrashed itself free, finally dislodging its clamping maw from its plates. 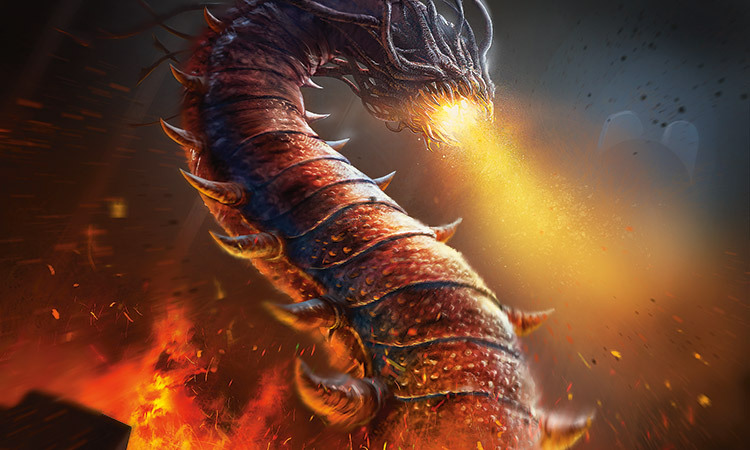 It lifted its head, flared its tendrils with a roar, and then dived back down into the lava plain. Waves rolled through the lava field, and subsided. No one said anything for a moment, until they were sure it wasn't coming back immediately to devour them. Chandra leaned her hands on her knees as she caught her breath. "Sorry I ruined the chant," she said. Her mane of flame slowly abated, turning into her usual hair. One lock of hair stuck out crazily. "That was it," said Serenok with a soot-smudged smile. He coughed into his fist, but it didn't stifle his grin. "You've done what I've only see one other person ever do. You're ready. You're her." Chandra was back in her bed at the monastery. She had a sinking feeling that it might, in fact, be that time people call morning. To make matters significantly not-better, she could tell it was Mother Luti's voice at her door. "Chandra," Luti repeated. "Up. It's midday." "How can you tell?" Chandra murmured, without budging. "From the inside of my eyelids, it looks exactly like sleeping time." Chandra sat up finally. "Listen," she said, sighing the sleep out of her brain. "If he wants to talk about chanting exercises, tell him tomorrow might be better—"
The abbot's memorial was short, held on the rocky clearing just outside the steps of Keral Keep. They were the same broad, stone steps Chandra had ascended when she first became a Planeswalker. Many of the fire monks gathered there were among those who welcomed her here as a perplexed young pyromancer. "We were all Serenok's acolytes," Mother Luti was saying. "All of us who knew him learned lessons from his life of flame and passion, and from his dedication as abbot of this Keep." Chandra was crying—half in bewilderment, half in a kind of anticipatory grief. She could tell she wasn't feeling the brunt of the pain yet. She could feel it coming, like a presence moving toward her in the dark. "Serenok's body gave out as he slept last night," Luti continued. "And in his passing—because he was a teacher to the end—he bestowed on us a final lesson. He showed us that in the time we have, we must choose a path and devote ourselves to it. We must find the fire within us, and let it grow, and offer our lives to it. And we must see that fire stoked in the hearts of others." She clasped her hands together. "Goodbye, Serenok." The monks lowered their heads. Their hooded robes fell down over their faces. When the ceremony concluded, Chandra did not return to the monastery with the others. She walked away from the Keep, deeper into the mountains. She heard Luti calling after her, but she did not turn back. A relentless Regathan day became a roasting Regathan night, with smokestorms swirling in the skies like the snarl of emotions inside Chandra. It was dark enough now that she couldn't see the outline of the great volcano against the sky. But she could make out the thin lines of lava meandering down its side. At this distance, they didn't look like they were flowing at all—she could imagine the glowing threads trickling down, or if she changed her perspective, she could see them climbing their way up the slope and into its heart. Chandra settled down under an overhang of rock, below a nest of cindermoths. She watched a stream of the moths spiraling up into the night with tiny wings of flame. She had always chafed at Serenok's expectations of her. But would it have killed her to learn the chants, and practice the exercises along with the others? Would it have been so bad to live up to what he saw in her? She cried and thought not of Serenok's lessons, but of his kindness, his encouragement. She felt a hollow place inside her, a deep well edged in pain. She had expected a wave of emotion at the teacher's death, something more tangible that she could lean against, something she could defy. There was no defying this hollowness. It was not something she could fight. She could only live in the empty space of it. After a time, she wanted her bed more than solitude. She made her way back to the monastery through high-walled mountain passes, blasting fire spells into the darkness ahead of her. Cindermoths swirled in her wake. It was morning when her footsteps finally brought her back to the monastery. Mother Luti sat on Keral Keep's stone steps, a folded garment on her lap. It was Serenok's robe, the abbot's mantle, threaded with igneous filaments. "Why would you greet me with this?" asked Chandra. Her muscles were weary and her heart was a hurricane, a storm swirling around an empty space. She had never seen the robe when it was not draped over Serenok's shoulders. Her eyes flashed. "Are you intentionally trying to hurt me?" "No, I understand," Chandra said, stepping in close to Luti's face. "Serenok is dead, but the lessons must go on! We all need to gather in the big hall before his robe has even gone cold, right? Because we need to fill that hole. That's what you're here to tell me, isn't it? That it's been hours, and we've moved on, and we need to choose a new abbot?" "No, Chandra," said Luti, looking down at Serenok's mantle. "I'm here to tell you we've already chosen one." "I can't," said Chandra, for what felt like the hundredth time. "I am no monk. I am certainly no head abbot." She sat at a long granite table in the heart of the monastery, surrounded by elder monks with robes in colors of flame. Serenok's mantle lay folded on the table before her. "As Serenok always said, you are one of the most talented pyromancers ever to grace Keral Keep," said Luti, her hands clasped together, her face kind. "He saw you as resourceful, creative, forthright. Your words and your magic always come from the heart, just like—"
"—just like Jaya. We could all learn from your example." That was kind to say, but they weren't actually listening to her. She could feel a haze rising over her vision. "I could never take Serenok's place! I'm no teacher. I'm barely even a student. I'm sorry, but I have to refuse." Some of the monks looked at each other. "Chandra, it is a great honor to be asked to be abbot," said another monk, his long beard nearly touching the stone table. "If the mantle is offered, it is your responsibility. You must accept." "Hey," Chandra said, slammed her fists on the table suddenly, on either side of Serenok's folded robe. Her hair momentarily crackled with flames. "Let me advise you now. Talking about what I must do is not a good way to persuade me." Mother Luti's mouth was a thin line. 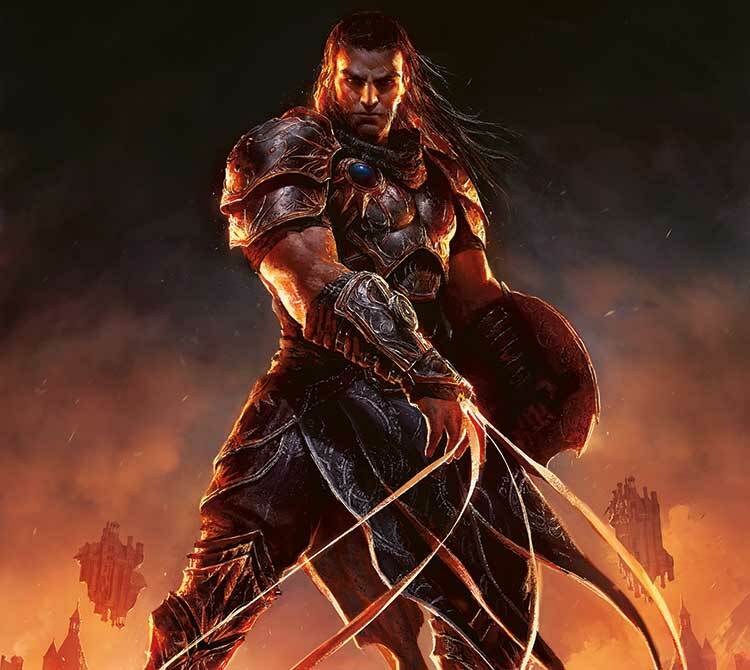 "Serenok knew he was at the end of his life, Chandra. He was testing you. He saw something in you." "Serenok believed I was someone I'm not," said Chandra. "Please believe me. You do not want me heading this place. I don't know the chants. I foul up the footwork. I'm not the best at anything you do here." "Then, as Serenok was fond of saying, this will be the perfect challenge for you," said Luti. The words jabbed her in the chest. She sat back, and her shoulders dropped. She squeezed her fists into her eye sockets—whether to stifle tears or to blot out what she saw around her, she did not know. She opened her eyes and looked around at the faces of the fire monks around her. This place, these people who had taught her so much, wanted her to teach them. If she stayed, she could show them how much it meant to her, when they took her in that day all those years ago—when she came to them as a scared orphan from another world. "Do you think I actually could?" Chandra asked. Mother Luti stood, spreading out her hands. "Chandra Nalaar, will you take up Serenok's mantle, and be our Jaya? Will you guide us in the principles of Keralian pyromancy? Will you teach us the ways of fire?" Chandra stood, surrounded by her peers. Something about this hall felt safe, like the disheveled blankets of her bed. Maybe she could commit to this path. Jaya only passed through Regatha briefly—maybe she could be the Jaya who didn't just pass through, but stayed. Maybe becoming a fire-blasting abbot could be fun—and a way to start to fill that painful pit in her heart. As she stood before the table, trying to find words, two men—dressed in distinctly non-Regathan garb—rushed into the chamber. One of them was broad-chested and chin-bearded, in sturdy armor, and the other was slighter, smooth-cheeked, in a rune-covered blue hooded cloak. All heads turned to the two men. They looked right at Chandra, and she recognized them both. Chandra sputtered. "What is—what is this?" "It's good to see you, Chandra," said Gideon Jura. "We need your help." 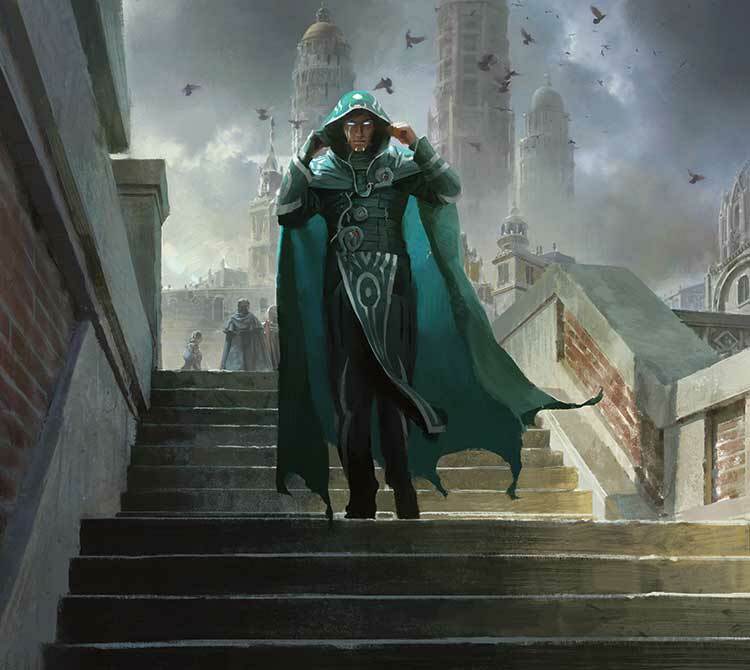 "It's about Zendikar," came Jace Beleren's voice in her head. 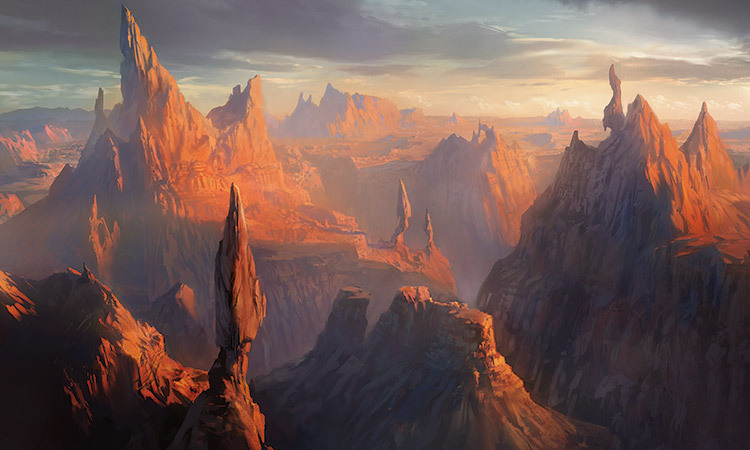 Chandra brought the other two Planeswalkers outside, down the steps of the Keep toward the slopes of Mount Keralia. 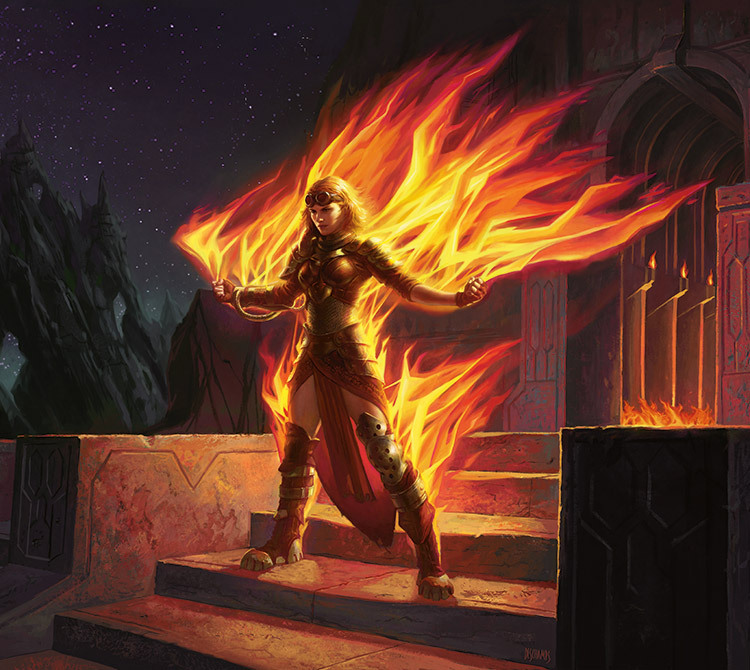 Two Planeswalkers from separate moments in her past—reminders of other planes, other times in her life—showing up here, just as she felt connected to the people of Keral Keep. She tried to find room in her brain for the entirety of the juxtaposition. "So," she said. "Gideon. Coming by to enforce some laws? Who are you after now?" "And you," Jace added. "We've got a mission. 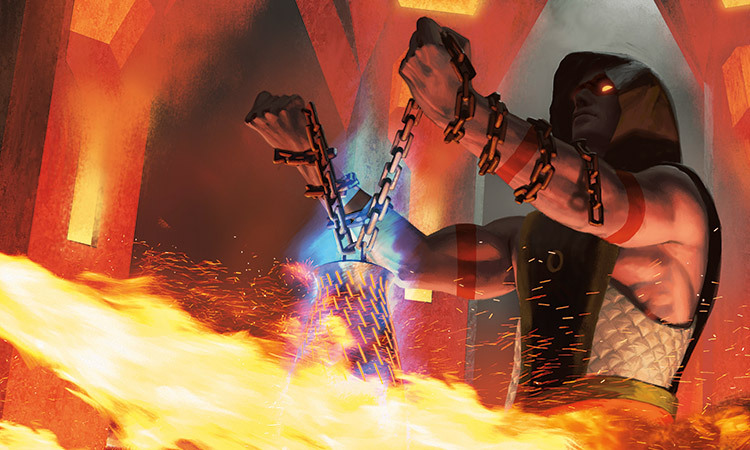 We could use a pyromancer." "Well, your timing is appallingly bad." "I'm sorry if this is a difficult time," said Gideon. "And if you need to be here, you need to be here. But we need you, Chandra. Zendikar needs you." Hot air swirled in her chest. "Zendikar said that? Is that a direct quote?" Chandra paced back and forth, not sure what to do with the animated temper she suddenly felt. "How sweet of you both to think of me. How in hell do you two even. . . ?" Gideon tipped his head at Jace. "Met recently, on Ravnica." "So you're bouncing around from world to world, looking for people to uproot? Is that it?" Gideon opened his mouth and closed it. In that silent moment, Chandra seemed to hear whispers of a world of tortures he had endured. Chandra felt a streak of empathy for him fighting with her stubbornness. "Gideon, you know my history here. You of all people should know that I've made sacrifices for this world." The pyre of the distant volcano glinted in Gideon's armor. "It's not the only world that needs a sacrifice." "Remember," Jace added. "You have a hand in Zendikar's current state. We have a debt to pay, you and I. Like it or not, we have a responsibility." Chandra's eyes literally blazed. She spoke slowly, with as much calm as she could muster through gritted teeth. "Can everyone. Please. Stop talking to me. About responsibility." Gideon clenched his hands together. "Chandra," he said, and his hands touched his chest. For him, that small gesture was like open pleading, an expression of surprising need. Jaya would go with them. Jaya would go with them. Gideon looked at Jace, and back to her. He tried to step toward her, to reach out and touch her arm. But Chandra glared at him and a ring of fire grew up around her, encircling her with a personal wall of flame. "This is where I'm needed most," said Chandra. She folded her arms. "I belong here. I've made a promise." And in her heart, it was true. "Gideon," said Jace. "I think we're done here." Gideon looked in Chandra's eyes for a long time. Then he nodded and said, "If you change your mind, find us at Sea Gate." He barely glanced at Jace's boots. "Let's go." When they planeswalked away, the air smudged, obscuring her view for a moment. When they had disappeared, she looked beyond at the stone steps leading up into Keral Keep—and she saw Mother Luti standing there, looking on from the doorway, with Serenok's mantle in her hands. Chandra nodded to Mother Luti, and walked up the steps toward her.